See the WAVE newsletters here! The Polly Woodside is a three masted sailing barque with an external cladding of iron plates. She was launched from the yards of Workman Clark in Belfast in 1885. 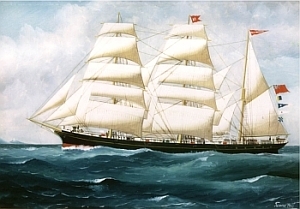 Her early years were in general cargo, including the nitrate trade between the UK and South America. She made her first voyage to Australia in 1900 and was bought by New Zealand interests in 1904 and renamed Rona. She operated mainly between New Zealand and Australia often carrying cargoes of timber. The Polly Woodside Volunteers' Association (PWVA) is an incorporated body set up in the 1970s to represent the volunteers who maintain the world-famous iron barque Polly Woodside, the Duke and Orr's dry-dock, the pump-house and the maritime museum site on the Yarra River in Melbourne.